A soft courgette need not be a waterlogged courgette, despite childhood recollections. It need not be alarmingly mild, swampy vegetal matter. Instead it can be a like eating cloud tinted green, gorgeous and plush. With slow cooking in oil and butter, courgettes can become sensational. I was reminded of that this evening, with this dish. The lemon and the butter together, too, give an extraordinarily delicious flavour here. Place the courgette rounds with the garlic and the oil and butter into a small pan or frying pan that just fits them with a pinch of salt and turn the heat on low. Cook slowly for 20-30 minutes half covered by a lid until very soft. Turn them with a wooden spoon occasionally. While they are almost ready, boil a large pan of well-salted water. At least a litre of water. When it’s boiling furiously, add the pasta. 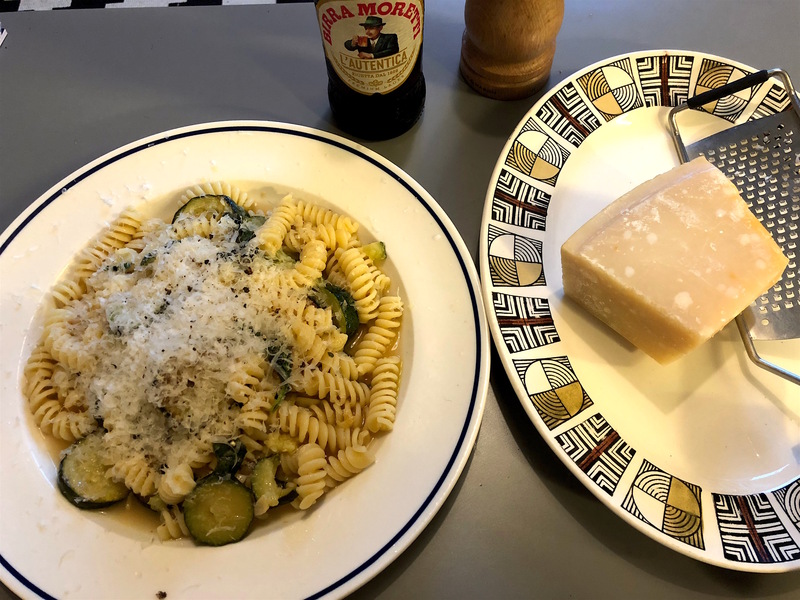 When the pasta is almost ready, add half a ladle of water to the courgettes and squeeze in the lemon and grate in the zest and shake the pan repeatedly until the water, oil and butter and lemon are a little emulsified. Tear in the basil leaves and stir. Taste for seasoning and add more salt if wanted. Drain the pasta, reserving a little water, and add the pasta to the pan with the courgettes. Turn the pasta in the sauce and add a little more cooking water if needed.